This article is about the high-end corrugated box printed inside and out. Corrugated box can be luxury and high-end when it is printed inside and out by using the B flute, E flute or F flute corrugated board. The corrugated box printed inside and outside usually comes in 2 styles, B flute corrugated printed box and E flute corrugated printed box. The E flute corrugated printed box is recommended when you need a small or medium size paper box, while the B flute corrugated printed box is recommended when you need a large size paper box. Compared with the E flute paper box, the B flute corrugated box is thicker and stronger, providing a better protection to the protects inside thanks to its extraordinary durability and rigidity. The double sided printed corrugated box below is litho offset printed inside and outside. But both sides have quite the different finish. On the outside, the box is printed matte black achieved by the matte laminating, while on the inside, the print is semi-glossy varnished. 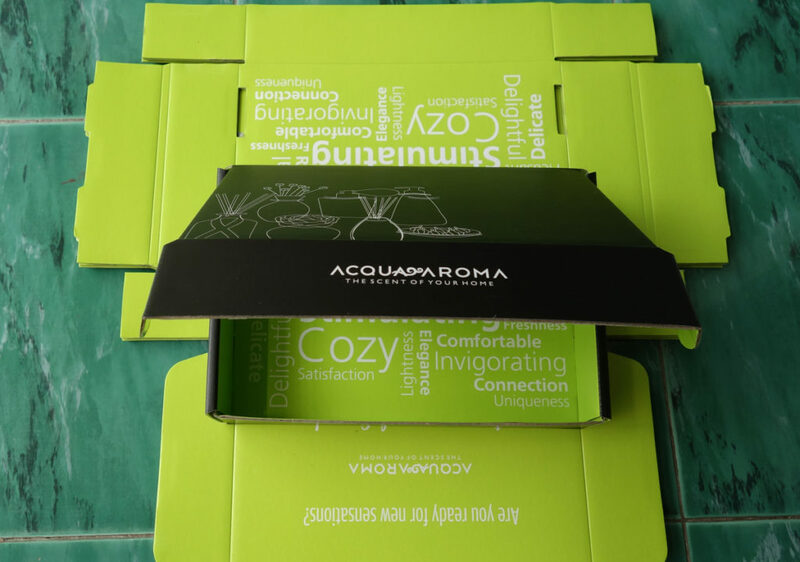 The corrugated printed box is made of the E flute corrugated board, which is matte black printed outside and semi-glossy green printed inside. 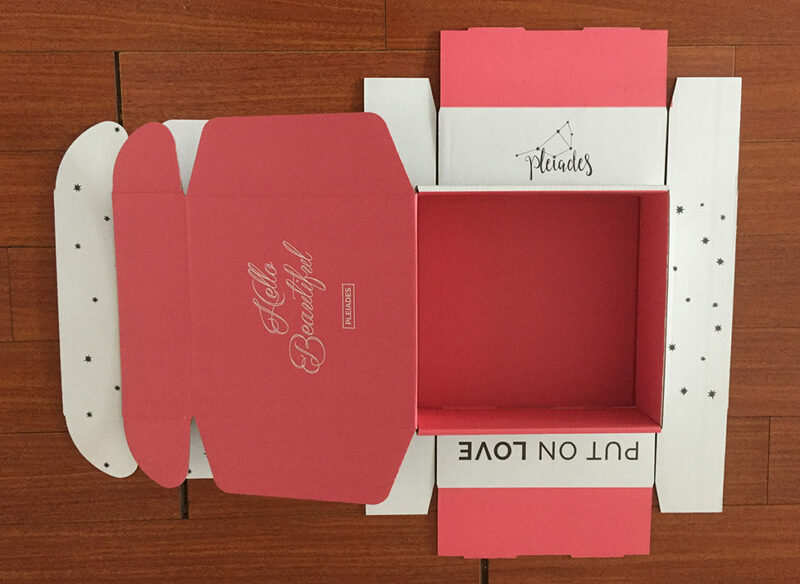 This is a typical E flute mailer box printed inside and outside, which is one of our most featured products. 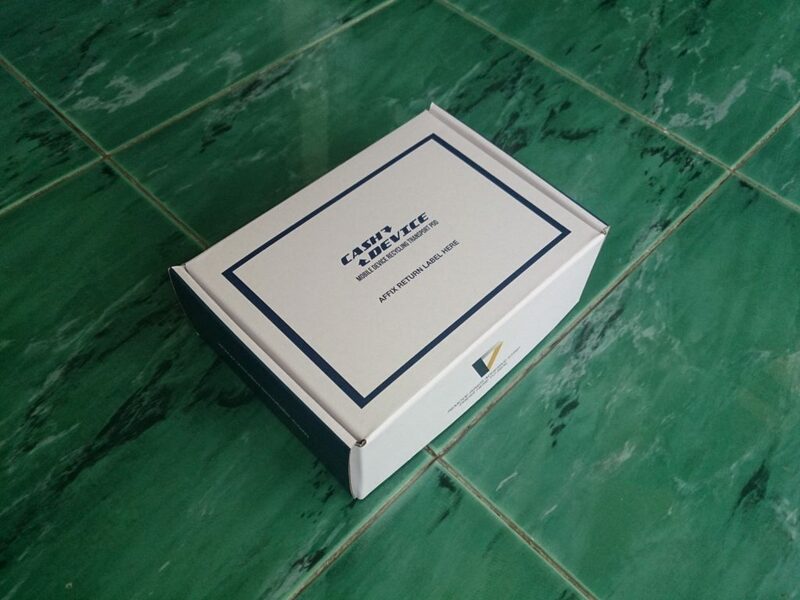 The box is flat shipped and packed to reduce the shipping cost and warehouse cost. Also, the box is a completely die-cutting paper box without using glue water or tapes, easy to setup. And it is very strong for the long distance delivery due to its very special structure. 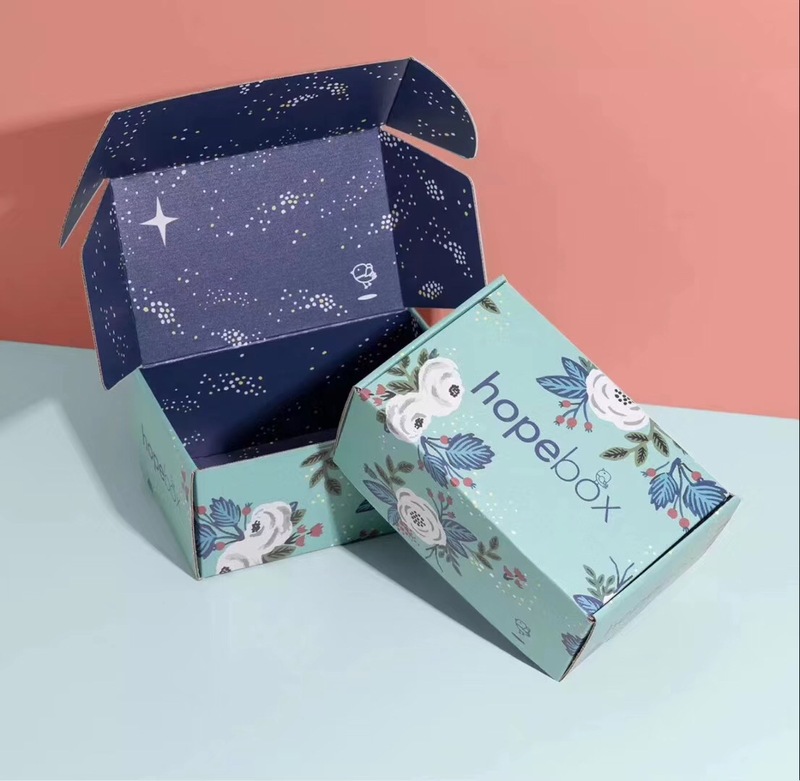 The most stunning point of the box is that it is really beautiful when you want a pretty but strong package for your product. The corrugated mailer box is printed outside and inside. There are 2 printing solution to the double sided printed corrugated box. One is the litho printing, which is also referred to as offset printing. The other solution is the flexo printing. The 2 solution has quite the different production process. For the paper material, the litho printing is usually applied on the E flute corrugated box, which usually has 4 layers, CCNB paperboard laminated on both sides. It is strong but heavy due to the high grammage. While for the felxo printed cartons, the 3 layer B flute paperboard is used with white kraft liner on both sides. The mailer box below is a corrugated box printed inside and outside by using the litho printing. 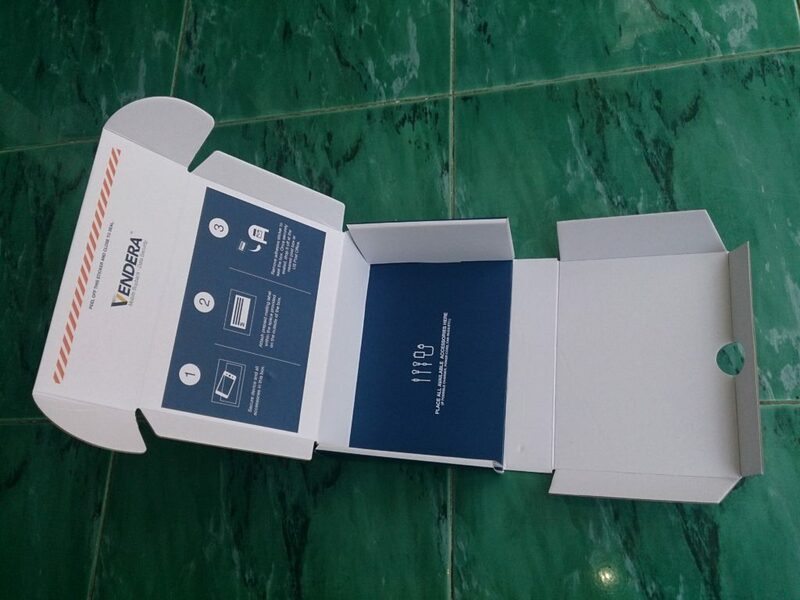 The box is made for the Vendera in USA for the mail purpose. The style is the roll end tuck top with dust flaps, a typical box style for the corrugated mailer boxes. But the box is well designed to have the custom die-cutting to have the integral insert. The board for the corrugated box printed inside and out consists of 4 layers, 300gsm art paper (SBS C1S paperboard) on the exterior and interior of the box, the middle 140gsm E flute paper and the 170gsm kraft liner. The combination gives the paperboard the excellent rigidity and durability, which is better than the ordinary 3-ply corrugated board. This will be very useful for the shipping of the products inside. The E flute corrugated board is only 1.8mm in thickness and F flute is only 1mm in thickness. The thickness of such paperboard is perfect for the high quality litho printing. The art paper used is also referred to the SBS C1S paperboard, 18pt in thickness. The box in the picture has the matte laminating on the surface to protect the inks from scratch and dirt. 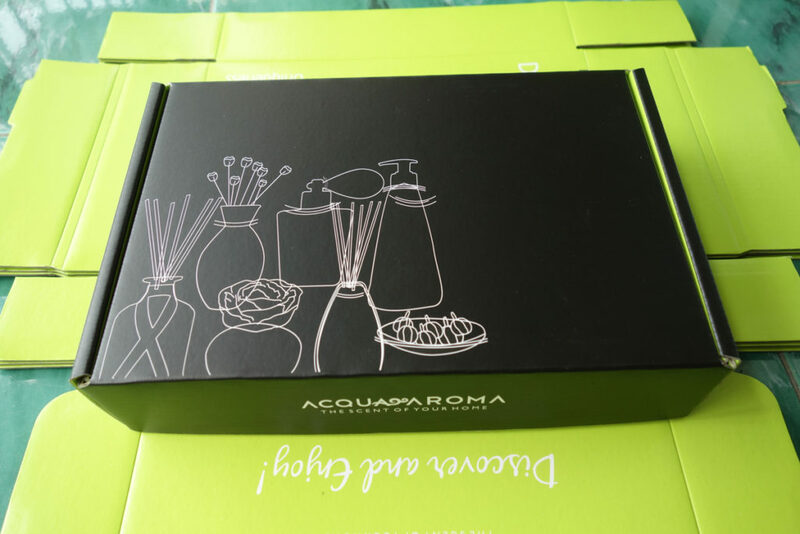 Since DE Printed Box is a custom paper box manufacturer, you can also choose the glossy laminating, UV glossy for the box design. If you need make the packaging design look more high-end and luxury, you can add the spot UV and foil stamping on the printed logo of the box. 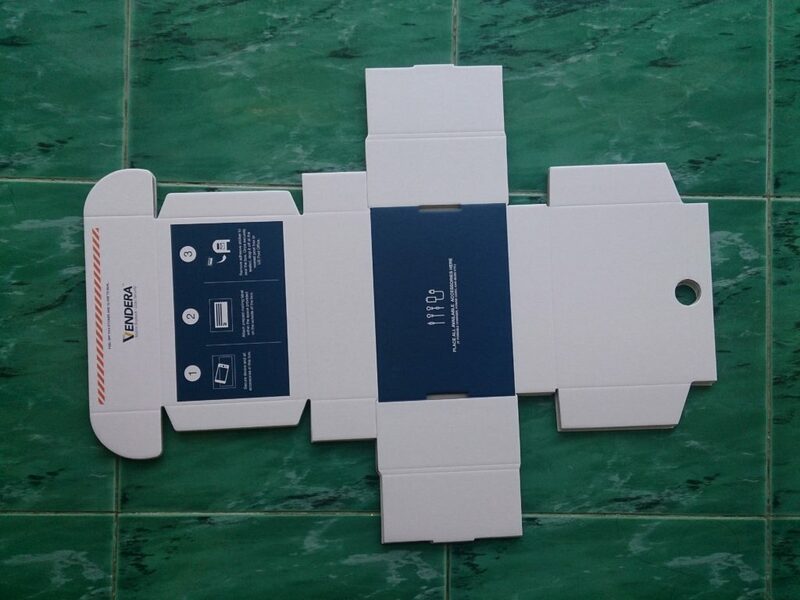 This is a electronics packaging box for the mobile phone. 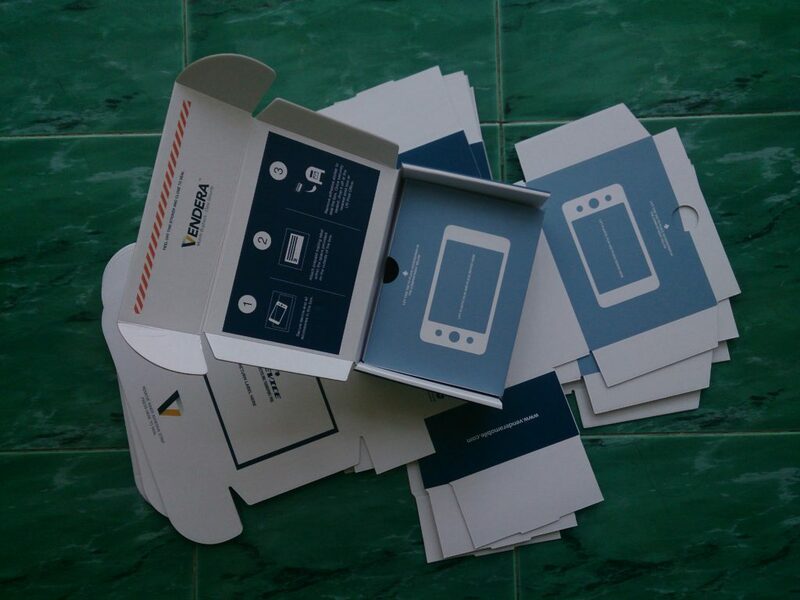 Check more litho printed boxes printed inside and outside. 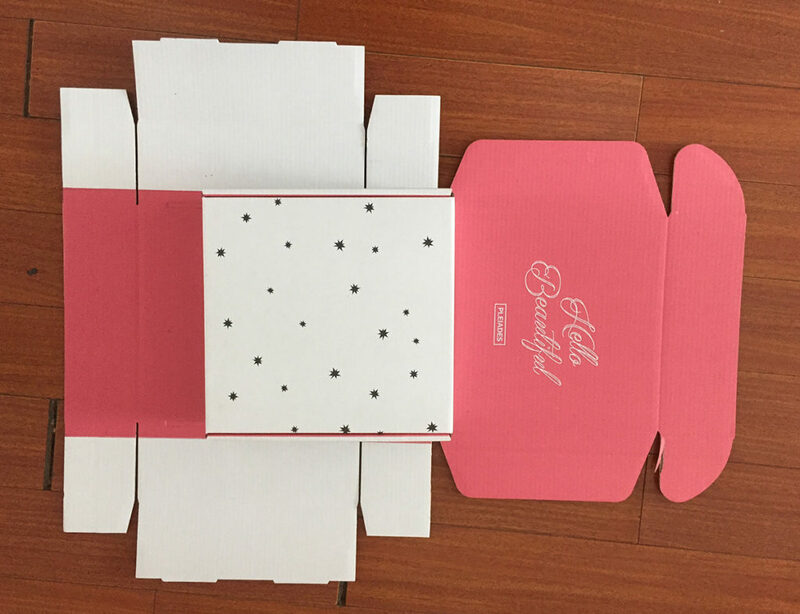 The carton box in the picture below is a B flute corrugated box printed inside and outside by using the flexo printing solution. On the ouside, the stars are printed black color and the side panel has the pink color. On the inside of the mailer box, it is only pink color printed. Compared with the E flute carton printed inside and out, the B flute carton has the advantage of light weight and low grammage. It is quite useful when you need reduce the mailing cost. 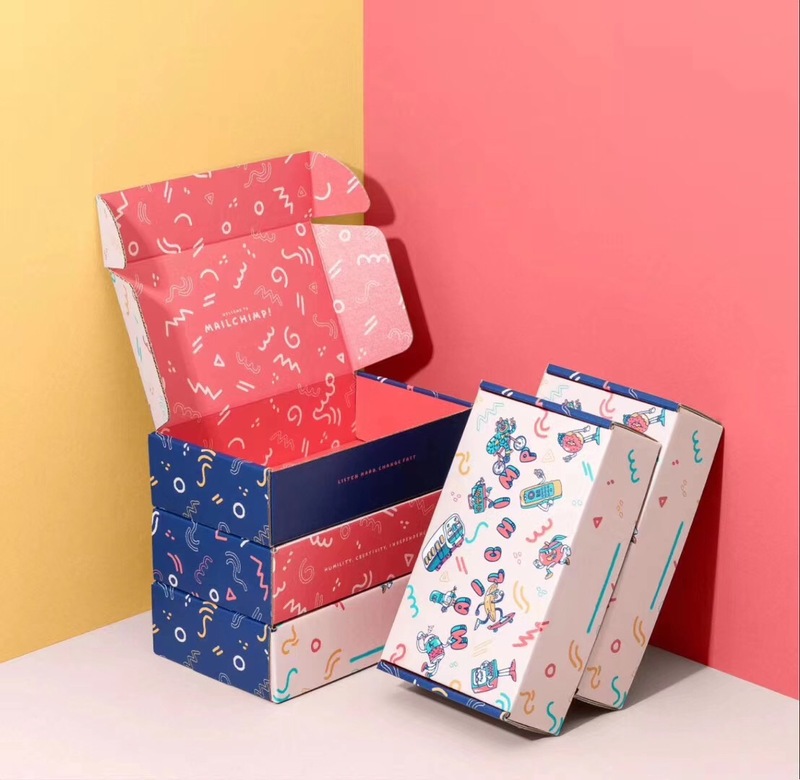 The corrugated box printed on both sides is most featured products. Because the paper box is printed inside and outside, it actually has 4 layers, 2 of which are the CCNB paperboards laminated. The complexity of the paper box makes the price a little high compared with paper box only printed outside. And the defective rate is higher due to the complexity of the production process. 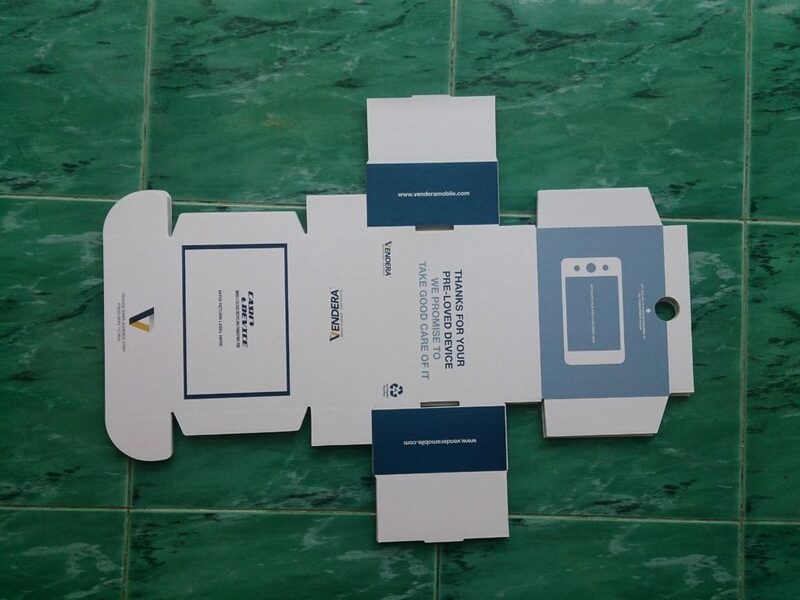 Therefore, we spent years to develop the techniques to produce this eye-appealing paper package cost-effectively with a lower defective rate. At the moment, we have successfully solved the quality problem. Below are more corrugated box printed inside and outside. E flute corrugated box printed inside and outside. Shanghai DE Printed Box is a custom corrugated printed box supplier. If you have a corrugated printed box do make, just email at kris@deprintedbox.com for a price quote. Also you can check our official website www.deprintedbox.com to learn more about us. This entry was posted in Packaging Design, Printing And Finish on July 4, 2016 by Jane.